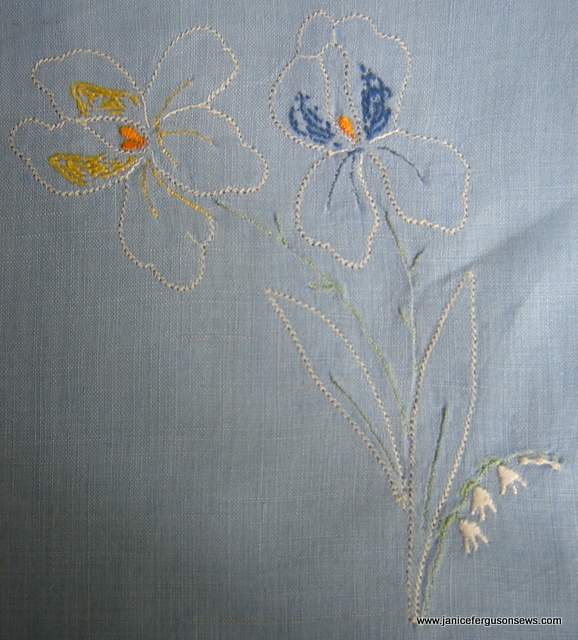 The Madeira applique’ is so well executed that the iris almost appears to be painted in place. The holes in the point de Paris/pinstitch that secure the linen pieces to the foundation are so much smaller than those made by machine with a 100 or 120 wing needle! I do love machine made pinstitch. But studying these tiny stitches reminds me that while machine stitches may exactly duplicate the point de paris stitch sequence, the result differs greatly from the handstitched version. Another noteworthy feature of these linens is the crisp, clean cutwork edges. Not a single whisker escapes! 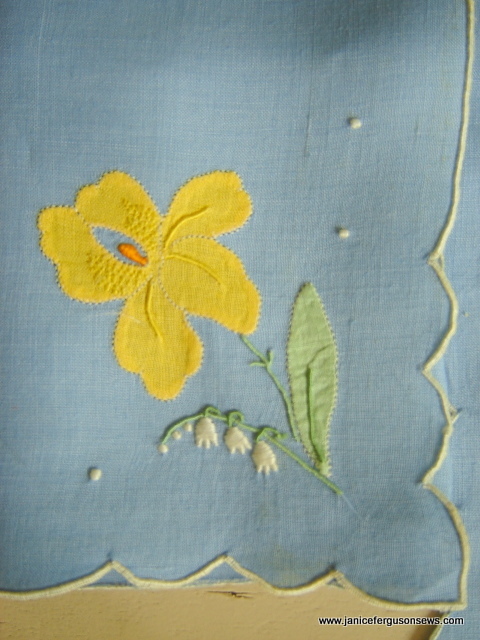 The surface embroidery is beautifully raised and dimensional. The orange iris stamens and the lily of the valley flowers are smooth as satin. 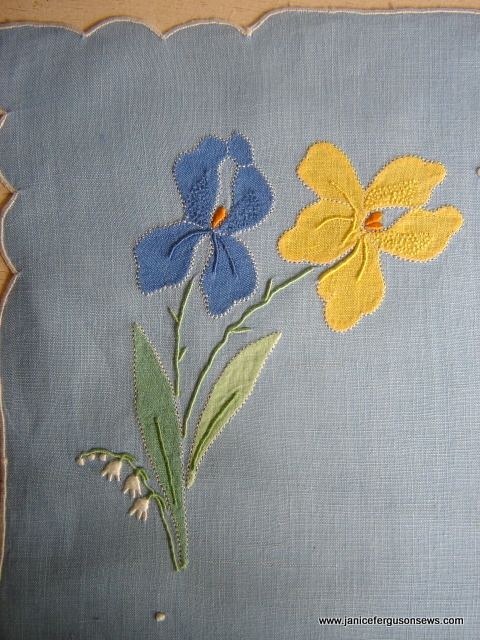 I especially like the French knots that give welcome texture to the irises. The backs are as neat and perfect as the front. I’m looking forward to entertaining houseguests next month. After teaching in Orlando, Terri Click will visit and a week later Carole, an old friend from high school, will come by. Those occasions are special enough that we may have tea in the potting shed and use these pretty linens. This entry was posted in antique textiles, antique/vintage textiles, hand embroidery, home dec, Madeira applique and tagged antique linens, antique textiles, cutwork linen, Madeira applique linen, tea linen, vintage placemat set. Bookmark the permalink. I love your placemats. 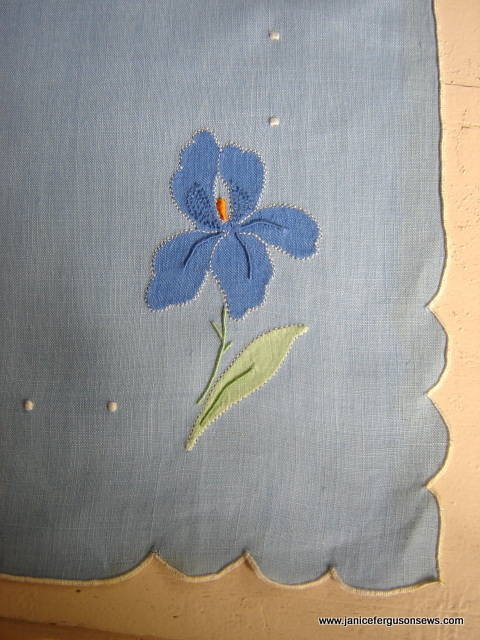 The applique is definitely so well done. There are 4 factors that makes me love the mats. 1. Lily of the Valley is my birth month flower, 2. Iris is the TN state flower 3. Love applique and 4. I am drawn to all things blue! 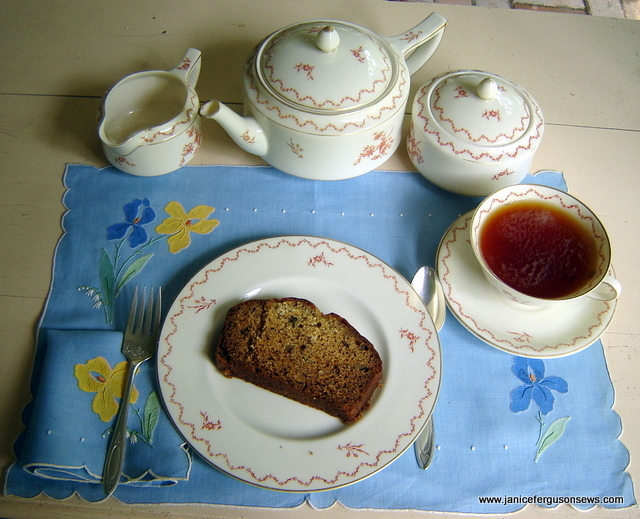 Oh I can not wait to have tea in your potting shed, and I’ll try not to spill, but I think you might want to give me a paper napkin or an old rag… these are to pretty and special! !